The first thing they will have you do at a pro or college tryout is run the sixty yard dash. It is well known that football runs the forty yard dash, so why does baseball run sixty yards? Going from home plate to second base is sixty yards. That is the best answer I can find. Working on pure speed is not one of the best baseball training drills. Now if you are headed to a pro or college tryout, then research some drills to improve your sixty yard dash. Because running a fast sixty will turn some heads. At these tryouts they just line you up and run it straight. No running from home to second, like you would with a double. Nope, you run just a straight sixty yard dash. It lets the scouts or recruiters know how fast you are. But the best baseball training drills are designed more to improve your agility, quickness and flexibility to help you play better. It might take you five or six seconds to get up to top speed in a sprint. In baseball most things happen in less than five seconds. The shortstop must be quick to get to the hit in the hole. A center fielder must be quick to run down drives in the gap. When chasing these baseballs, there is not a lot of time to reach top speed. So the baseball training drills we offer here are more about getting you moving fast in a short distance. These drills are also called agility drills and are all about getting your muscles to react and explode quickly. They are designed to get your eyes, brain and muscles to communicate to each other in lightning time. One thing all fitness experts will tell you is when doing agility drills you need to do them at full speed. Going at any other speed than full blast will not give you much benefit. So push yourself to go all out on these drills. And be sure to take breaks that will allow you to continue at full speed. Another thing I would like to mention briefly is that working with a personal trainer is the best way to go. The trainer will probably have you do the same drills that you find here or somewhere else, but it’s the motivation and tracking that is so valuable. But please check out the article Training For Baseball to learn how to share your time with a trainer and cut down on the cost. OK, back to baseball training drills. There are two training aids that would be useful for baseball training drills. The first and probably easiest to find is cones. Most sporting goods stores and large discount stores sell them. 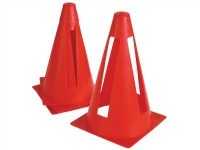 Cones are used to mark a spot, such as run to the cone and back. So, anything you have that would give a clear mark would work. The other item is an agility ladder. You probably have seen them. They are the ladder looking item that lies on the ground and athletes run through taking short steps. High steeping through an agility ladder is good conditioning for your legs. However, there are other drills that you can do that will accomplish the same thing. I have seen this drill called the “back and forth drill” or the “angle drill”. You start out placing four cones in a straight line about twelve yards apart. Next, you place four cones about ten yards across from the first three, only start this line about five yards farther down. Now you are set to begin the drill. Start at the upper left hand X and run to and around the first X on the bottom row. Now run to and around the second X on the top row. Continue to the end. Take a break and then return using the same drill. After you get in good shape, you may be able to return without taking a break. And there are variations you can do with this drill. For instance, you can run forward from the first cone to the second and then run backwards from cone 2 to cone 3. Run forward from cone 3 to cone 4 and backward from cone 4 to 5 and so on. This next drill is called the “side step drill. Set up the cones as in the diagram below. If you do not have nine cones, then just use any item to mark the spot. All cones, or items, should be placed ten yards a part. You will start at the top cone and run straight to the next cone in front of you. When you reach that cone, do not turn, but instead side step laterally to the next cone. Again, run to the cone in front of you, side step and so on. Once you reach the end, go back in just the opposite direction. Start out side steping to the left then run to the next cone. Remember that the best way for these baseball training drills to help you is by doing them at top speed. These drills are going to help your feet move much faster. These are great to add to your off season training. For this drill you need one or two boxes or mats that can be stacked to eight inches and/or sixteen inches high. Stand on the ground, jump up to the top of the eight inch box, Now jump back down to the ground. If you are using two boxes, then jump up to the other box. If you are using just one box continue jumping up and down from the box. It is hard to tell you how many of these you should be doing. The best gage is to keep doing them until you are too tired to continue. To push yourself, go until you think you cannot go another, then do five more and quit. However, be very careful and do not twist or turn your ankles. And most fitness experts recommend not jumping more than sixteen inches high when doing this drill. These drills and others that you can find on the internet will get your baseball training drills jump started. If possible, do your workouts with a teammate or friend. A little peer pressure will help keep you both motivated. Hard work will create some good luck for you.